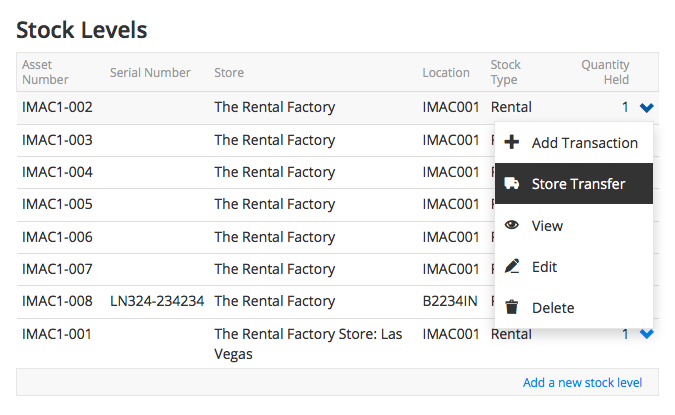 Stores in Current RMS are different locations where your stock levels are physically held, e.g. different warehouses or branches. When an item moves from one store to another, use a store transfer to record this in Current and make the stock available to opportunities in your other store. To add a store transfer, open a product page and go to the Stock Levels section on the left-hand side. Click the blue arrow next to the stock level and choose Store Transfer from the menu. On the Create Store Transfer screen, specify the destination store, date, and (optionally) a description. The transfer date must be equal to or later than the “opening balance” transaction date. You cannot transfer more stock than a store holds. When transferring a serialized asset, the stock level store is updated immediately to reflect the destination store, even when creating a transfer using a date in the future. If your transfer causes a shortage, Current will display an orange warning to let you know. With “enforce stock availability” enabled in System Preferences, Current will prevent you from transferring in cases where it will cause a shortage. From the stock level page, using the blue arrow to the right of the transaction in the list and choose Delete from the menu. Availability is calculated when you delete a transfer: Current will let you know if there’s a shortage or prevent you from removing the transfer if “enforce stock availability” is enabled in System Preferences. For a serialized asset, a transfer can only be deleted when it is the last transaction for the asset. This means that if there are transfers or transactions added after the transfer you wish to delete, you’ll need to remove them in reverse chronological order. As with creating a transfer, you cannot transfer out more stock than a store holds so ensure the transfer quantity is not greater than the quantity in stock at the destination store. Can I edit a store transfer? It’s not possible to edit a store transfer.